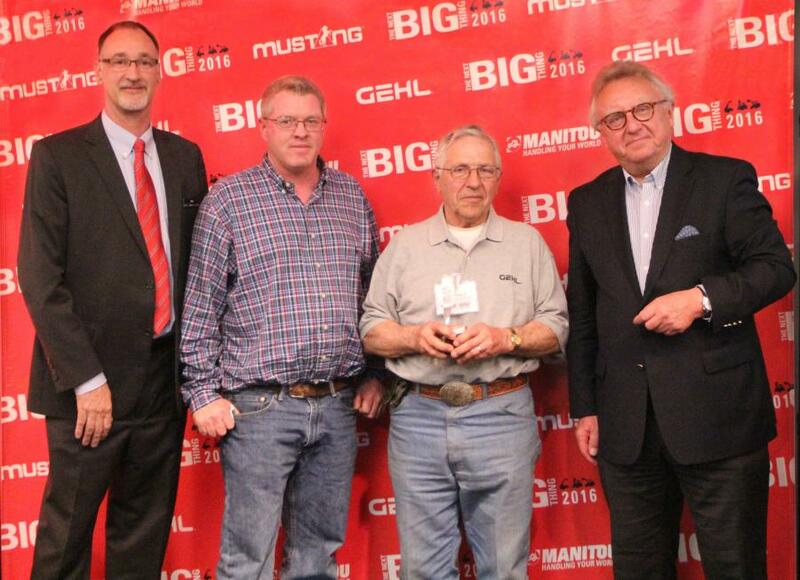 Dan Miller, President & CEO of Manitou Americas, and François Piffard, Executive VP of Sales and Marketing for Manitou Group, present the 2015 Gehl Top Dealer Award to Fritz Aschilman and Mike Tibbits from Farmer's Implement of Mineral Point . Gehl, a leading manufacturer of compact equipment for agriculture and construction markets, presented Fritz Aschilman and Mike Tibbits from Farmer's Implement in Mineral Point, WI with the 2015 Gehl Top Dealer Award. This prestigious award is based on the overall sales performance for North American Gehl Dealers in 2015. Farmer's Implement of Mineral Point was recognized and awarded for their top performance at the Manitou Americas corporate headquarters in West Bend, WI, during the “Next Big Thing” new product introduction dealer event.